William Marciano is a theoretical elementary particle physicist at Brookhaven National Laboratory and adjunct professor at Yale University. He is recipient of the Sakurai Prize, awarded by the American Physical Society for his groundbreaking work on the calculation of electroweak radiative corrections (together with Alberto Sirlin). 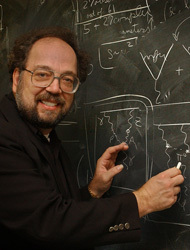 Marciano also was awarded the Humboldt Research Prize and a fellowship of the American Physical Society. In Mainz, he participates in the research of the Cluster of Excellence "Precision Physics, Fundamental Interactions and Structure of Matter" (PRISMA) and in the collaborative research center "The Low-Energy Frontier of the Standard Model – From Quarks and Gluons to Hadrons and Nuclei".